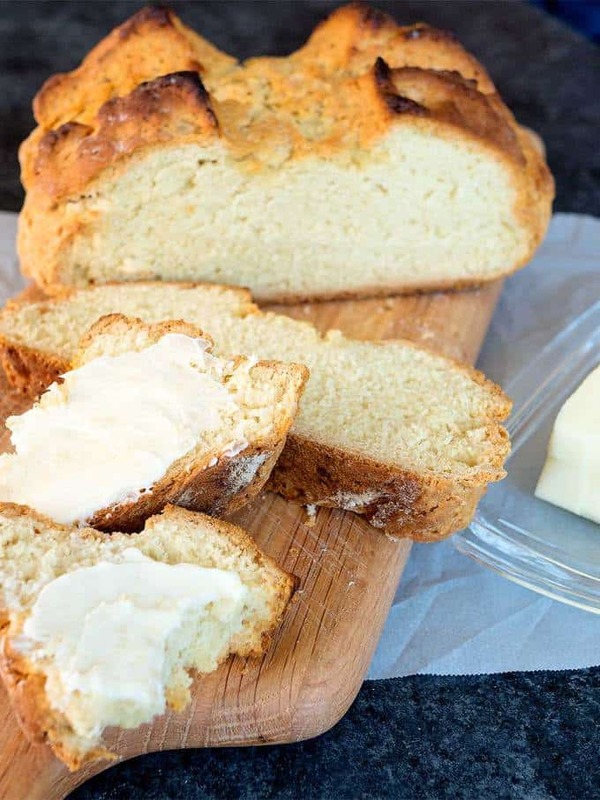 Irish Soda Bread is a rustic peasant bread requiring no yeast and no rising. It is amazingly easy to make, amazingly delicious to taste, and perfect for St. Patrick’s Day. The food processor does most of the work. The only real hands-on is a minimal working of the dough to form a cohesive and bumpy disc. 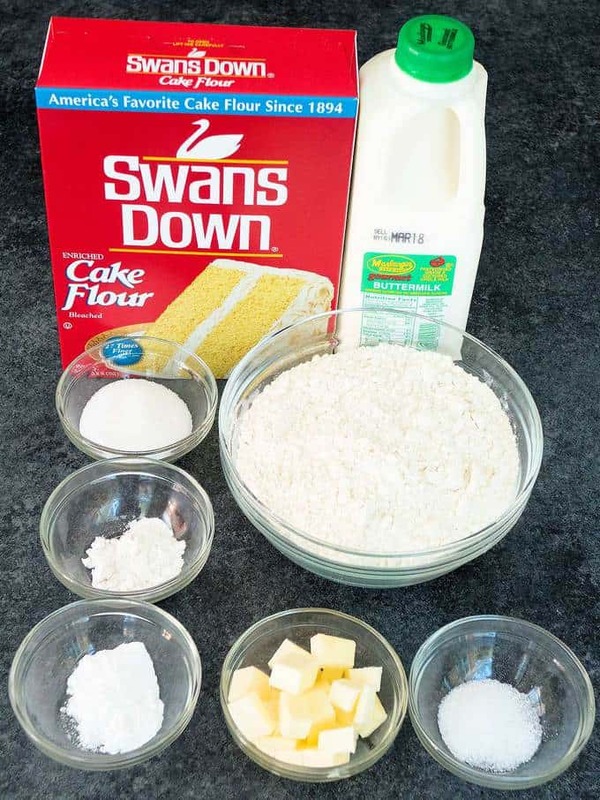 I used the following ingredients: All purpose flour, cake flour, granulated sugar, baking soda, cream of tartar, salt, unsalted butter cut into small pieces, and buttermilk. The America’s Test Kitchen recipe that I used as a starting point called for cake flour to soften the crumb. With just all purpose flour, the bread was doughy, heavy, and had a thick crust. I can honestly say that the cake flour made all the difference! I used my food processor to do most of the work. 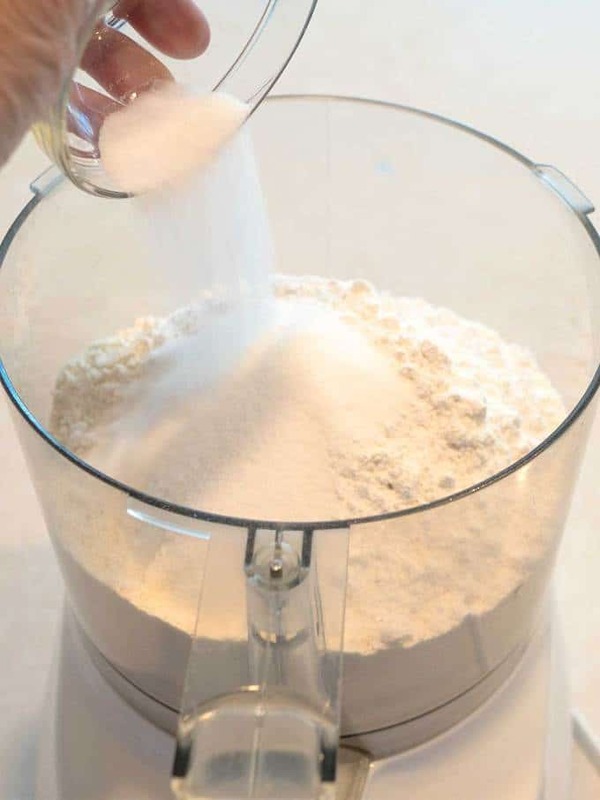 First, I added the all purpose flour, cake flour, sugar, baking soda, cream of tartar, and salt to the bowl of the food processor fitted with a steel blade. Then, I processed the dry ingredients until they were well mixed. Next, I added the butter, and processed the mixture until the texture resembled coarse crumbs. Finally, I added the buttermilk, and pulse processed the mixture just until it started to hold together. This took 6 or 7 pulses. 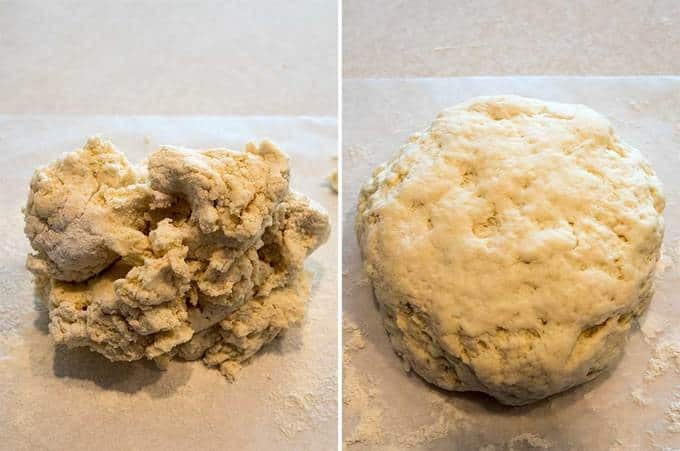 I dumped the dough onto a floured piece of wax paper, and kneaded it just until it became cohesive and bumpy. Next, I formed the dough into a disc that was roughly 6-inches in diameter and 2-inches high. 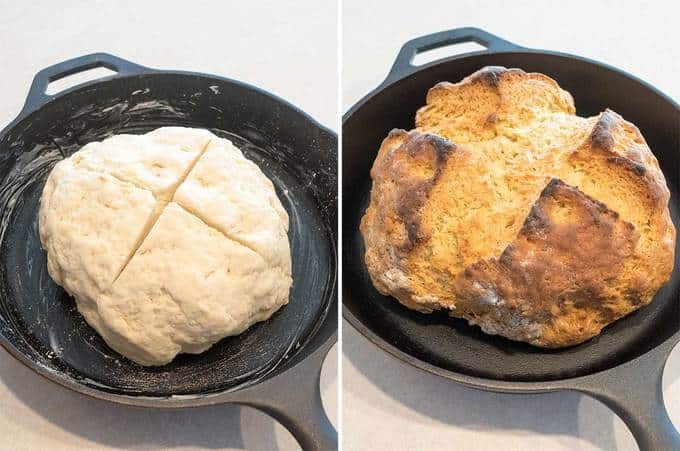 Then, I put the dough into a cast iron skillet that I had greased with butter, and cut cross shape on the top. I popped the bread into a preheated 400° F oven for about 45 minutes until a toothpick inserted into the center came out clean. 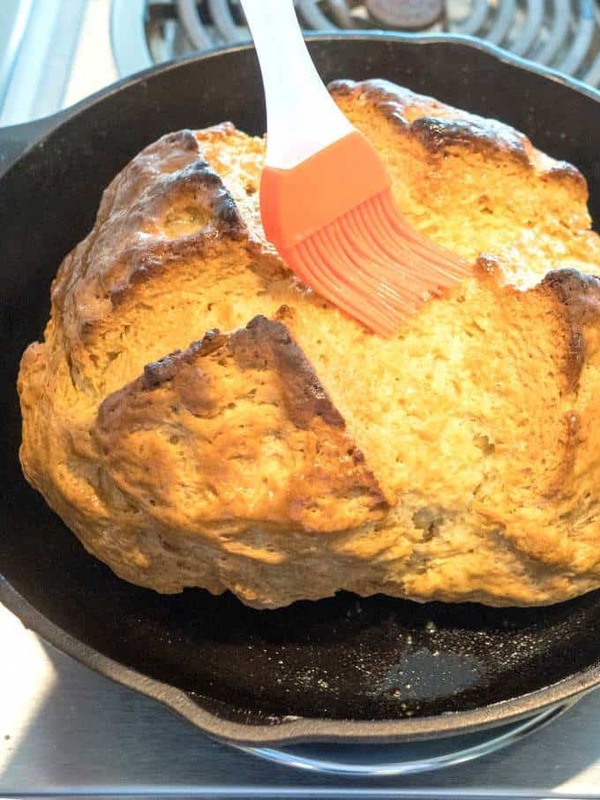 I brushed the top of the bread with some melted butter, and cooled it on a wire rack. 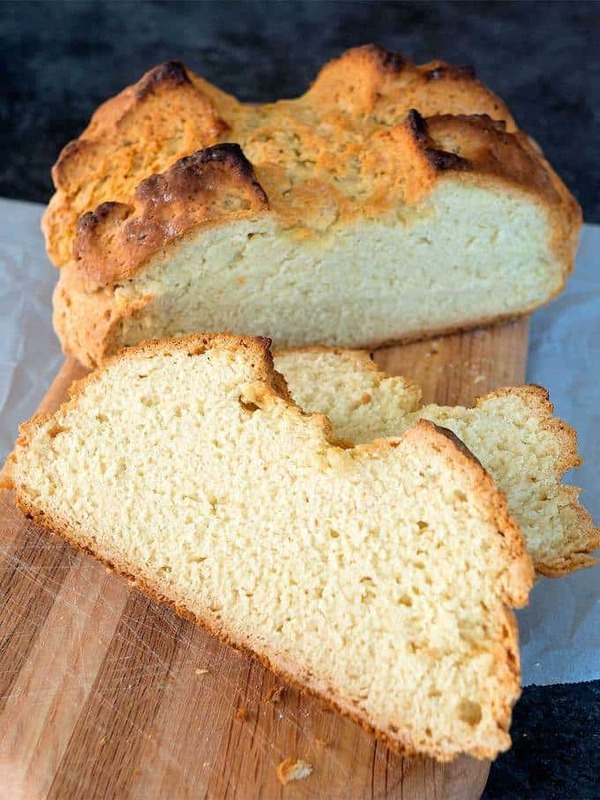 The Easy Irish Soda Bread had a crunchy crust on the outside, and a moist texture on the inside. Serve it by itself with butter, or with Guinness Beef Stew for a traditional St. Patrick’s Day dinner. Yum! 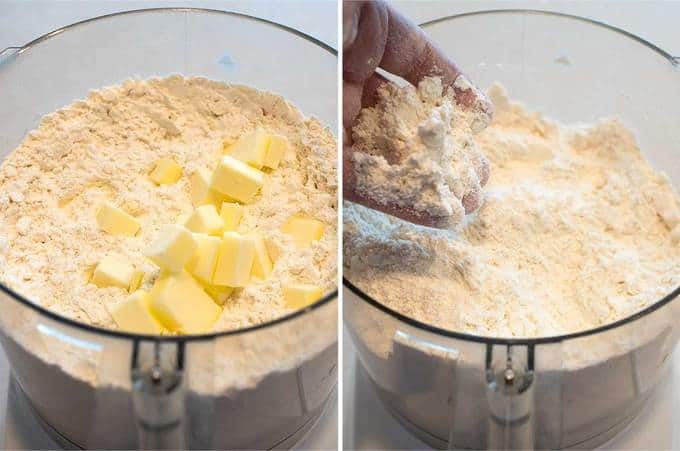 Add all purpose flour, cake flour, sugar, baking soda, cream of tartar, and salt in bowl of food processor fitted with steel blade. Process until well combined, about 10 seconds. Add butter; process until mixture resembles coarse crumb, about 10 seconds. 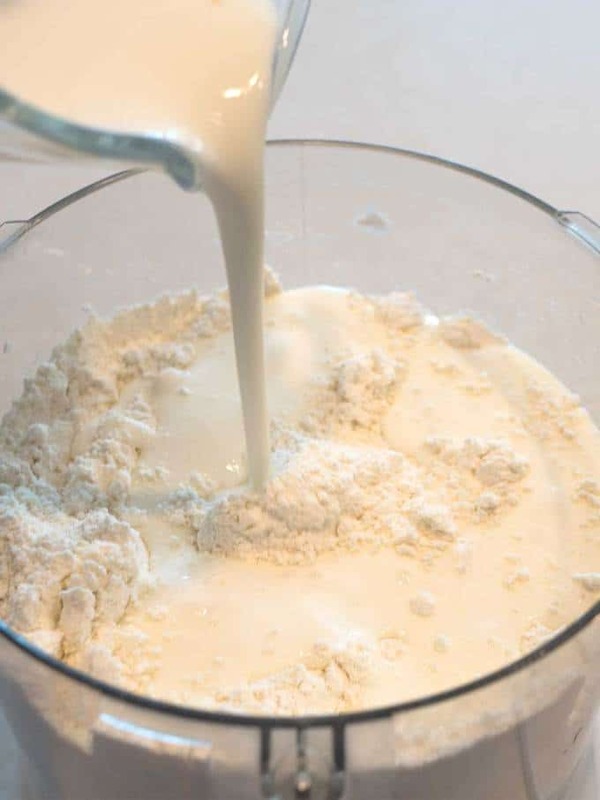 Add buttermilk; pulse process just until dough begins to come together, 6 or 7 pulses. Turn out onto flour-coated work surface; knead until dough just becomes cohesive and bumpy, 12 to 14 turns. Do not overwork dough. Pat dough into a round about 6 inches in diameter and 2 inches high; place on greased or parchment-lined baking sheet or in a greased cast-iron skillet. Cut a cross shape into the top. Bake until golden brown and a skewer inserted into center of loaf comes out clean or internal temperature reaches 180 degrees, 40 to 45 minutes. Remove from oven and brush with 1 tablespoon of melted butter; cool to room temperature, 30 to 40 minutes.